EVERETT, Wash., April 4, 2014 – Boeing [NYSE: BA] and Kenya Airways celebrated the delivery and flyaway today of the Kenyan flag-carrier’s first 787 Dreamliner. The airplane departed Paine Field in Everett, Wash., for the 7,800 nautical miles (14,456 kilometers) non-stop flight to Kenya Airways’ home-base in Nairobi at Jomo Kenyatta International Airport. Pictured here is Kenya Airways first 787 Dreamliner on a previous test flight. EVERETT, Wash., April 4, 2014 /PRNewswire/ -- Boeing [NYSE: BA] and Kenya Airways celebrated the delivery and flyaway today of the Kenyan flag carrier's first 787 Dreamliner. The airplane departed Paine Field in Everett for a 7,800 nautical mile (14,456 km) nonstop flight to Kenya Airways' home base in Nairobi at Jomo Kenyatta International Airport. The 787 will form the backbone of the airline's future long-haul fleet, providing greater range, improved efficiencies and outstanding passenger comfort. "The delivery of our first ever 787 Dreamliner not only opens a new chapter for our airline, but also for Kenya," said Dr. Titus Naikuni, chief executive officer, Kenya Airways. "The 787 will enable Kenya Airways to explore new markets, improve its economic performance, provide passengers with revolutionary comfort, while continuing to contribute towards the sustainable development of Africa." "The 787 provides carriers with the flexibility to expand their networks and reduce operating costs, while offering passengers an unsurpassed in-flight experience," said Van Rex Gallard, vice president of sales for Africa, Latin America and the Caribbean, Boeing Commercial Airplanes. 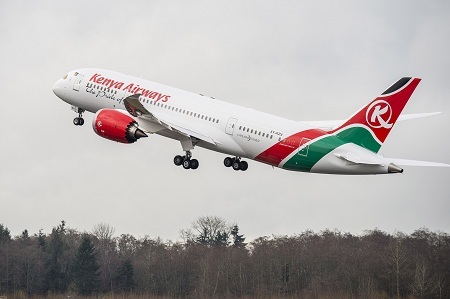 "The 787 will be an outstanding addition to Kenya Airways' fleet, providing the cornerstone of the airline's future success and enabling it to continue its mission to connect Africa to the world, and the world to Africa." Passengers traveling on Kenya Airways' 787 will experience the passenger-pleasing features of the Dreamliner such as larger, electronically-dimmable windows and larger overhead luggage bins. During flight the 787 is pressurized to a lower cabin altitude, has higher humidity levels, advanced air filtration and smoother-ride technology to make the flying experience more comfortable and allow passengers to arrive at their destination more refreshed. This delivery is the first of nine 787 Dreamliners set to join Kenya Airways' fleet. The deliveries of additional 787s, along with 777-300ER (Extended Range) airplanes, forms part of the East African carrier's 10-year strategic plan called "Project Mawingu." The plan is focused on increasing the airline's fleet size from 44 airplanes to 107 by 2021 and destinations from the 62 to 115. Currently the Nairobi-based carrier operates an all-Boeing long-haul fleet of six 767-300ERs, four 777-200ERs and one 777-300ER. Kenya Airways' first 787 is scheduled to begin flying regionally within Africa in the coming weeks, before beginning long-haul service to Paris in early June. Currently the "Pride of Africa" serves destinations across Africa, Asia, Europe and the Middle East. To date, more than 130 Dreamliners have been delivered to 17 customers worldwide.